A newly constructed home in an inviting neighborhood located just steps from the beach, Family Tides is a top-notch choice for your next Nags Head vacation. This four-bedroom vacation rental home in the coveted Village of Nags Head community is situated on a quiet side street, just 435 feet from the Epstein Street public beach access. Here you’ll also find a bath house and outdoor showers, an in-season lifeguard station, and a wooden walkway that leads you over the sand dunes and onto the wide stretch of sandy shoreline that awaits you. When you’re not spending your time soaking up the sun on the beach, you can still enjoy ocean views and sea breezes from one of the decks at Family Tides. Kick back and relax in an Adirondack chair to catch some rays on the sundecks that provide plenty of seating, or cool off in the shade of a covered deck while flipping through the pages of your favorite beach read. If you’ve spent the day participating in one of the many recreational opportunities the Outer Banks offers—from surfing and standup paddle boarding to kayaking and kite boarding—hop into the bubbly hot tub for a long and lingering soak that will put you into a state of total relaxation. Looking for a place to cool off after a hot summer day of fun in the sun? 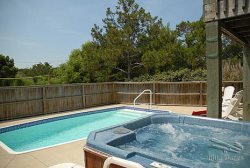 When you spend your Outer Banks vacation at Family Tides, you’ll receive access to a wide array of amenities offered by the oceanfront Village Beach Club, which is just a short walk down the street. Take a dip in the Olympic-sized community swimming pool that features lap lanes, a diving board and a wading pool perfect for the little ones in your family. The Village Beach Club also boasts a snack bar, cafe and a full-service bar, as well as several tennis courts, a bath house with changing facilities and ample oceanfront parking for guests. Golfing enthusiasts will enjoy Family Tides’ proximity to the Nags Head Golf Links, which is just a half-mile away from this vacation rental home on the sound side of the barrier island. In the mood for a bike ride, jog or leisurely stroll to take in the scenery and stay in shape during your stay on the seashore? Family Tides is right across the beach road from the paved pathway that extends for several miles to the north and the south, so you can explore everything the town of Nags Head has to offer without the worry of sharing the street with traffic. Because Family Tides is conveniently located in the heart of Nags Head, you’ll have easy access to a variety of Outer Banks attractions, restaurants, retail shops and local landmarks. Jockey’s Ridge State Park—which is just a 10-minute trip from this Nags Head rental home—is one of the best places on the entire island to catch a stunning sunset over the Roanoke Sound. The Nags Head Fishing Pier is also just a 10-minute car ride away from Family Tides and offers opportunities for pier fishing and sightseeing as well as a full-service restaurant and oceanfront bar with an amazing view from every seat. Family Tides’ gorgeous interior is just as inviting as the local neighborhood, with ample living spaces spread out across multiple levels. Enjoy a little peace in quiet in one of four stately and beautifully appointed bedrooms, or reconnect with the family after a sunny day at the beach in the pristine living and dining areas. From top to bottom, guests will enjoy stylish decor and touches throughout, making family time on the Outer Banks an effortless and enjoyable affair. Reserve your stay at Family Tides today to find out why this vacation home is heralded as the perfect elite retreat for every family!